Ch. 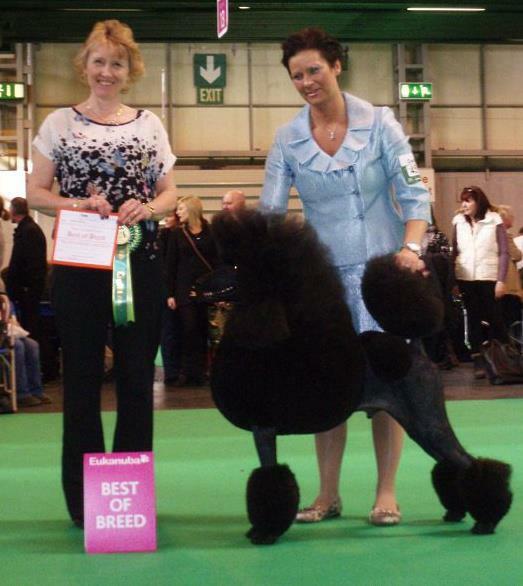 Aleph American Idol “Simon” BOB at Crufts 2012! This was the 4th time I went to compete with dogs at Crufts. And this time I flew to Brussel and hired a car from there, took the Dover-Calais Ferry to England and drove to our friend Philip Langdon in Bristol. There I was bathing and grooming Simon for the show. Kay and Thomas came there as well to do the preparation for the show. In the morning we had about 2 hours drive from Philip up to Birmingham. It was about 145 Standard Poodles entered and Mrs Sharon Hayne Pines, Vicmars Poodles were the judge. She was BOB and won the group at Crufts last year with Ch. Vicmars Rave On. Simon was showing perfectly and I was very happy for that, he won the open class and got Best Male and the Ticket, Thomas got Reserve Best dog. Thank you Sharon for appreciating Simon as well as I do and thanks to all the supporters! It is soo nice to hear all nice words. Thanks also to Philip and Darren for the nice hospitality, you make it so easy to come. I hope in the future that I can come and bring some offsprings to Simon and my other dogs. Philip Langdon also got BOB at Crufts with Ch. Huffish Another Point of View “Ryan” and I got BOB with his half brother Ch. Huffish On Every Street “Max”. ← Huffish Made for Headlines “Bonnie” Swedish and Danish Champion this weekend!